(01) Written by Spencer, Frezza, Nawara and Selph. Recorded by Jim Diamond at Ghetto Recorders, Detroit. Remix produced and mixed by Damien Mendez for www.soulchild.net and Stuart Bradbury for www.f-m-p.com. Launched by Soulchild (Sweets and FX). Fuelled by Stu and Damo (Music and mix). (02) Written by T. Spencer. 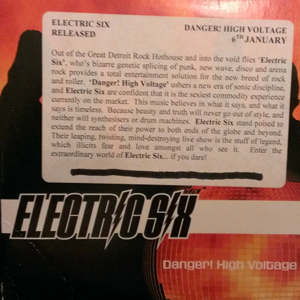 Produced by Electric Six with Al Sutton. Front layout by Surge Joebot.